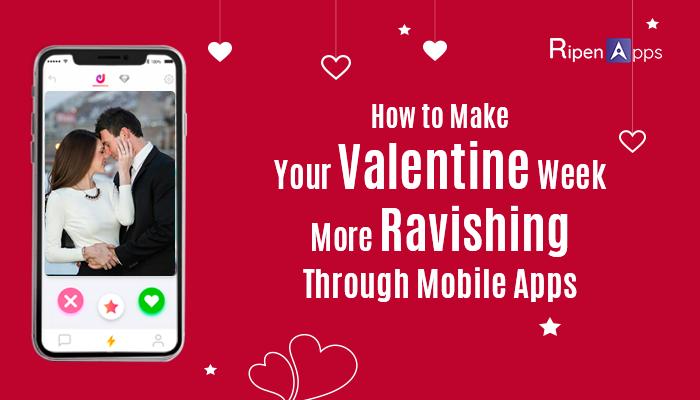 How to Make Your Valentine Week More Ravishing Through Mobile Apps? Everyone has a soul mate-at least that’s what fairytales would have us believe & Valentine’s Day is once again upon us to celebrate our fairytales. Those in love are preparing to spend a romantic evening together filled which chocolate, food, flowers, and fun together. If you are getting prepared for one of the most romantic days of the year and you are having trouble getting things together, then there are numerous mobile apps that solve your purpose, In today’s tech-enabled era, Mobile App Developers through their innovative mobile apps can help you spice up your love life as well. From making plans for Valentine’s Day, sorting through gifting options, or zeroing in on the best place to dine out, couples have everything handy when armed with Smartphones. Today we are excited enough to unleash a few red-hot Mobile App Development trends, just in time for the most romantic day of the year. Do You Want To Search A Date? Seek your Valentine through the Mobile App. It’s almost Valentine’s day, and once again, you find yourself dateless. Is it true? Are looking for a date? Well, you would not find yourself dateless this year. There are many Best Dating Apps for 2018, and they have made it easier than ever to get a last minute date while putting in as little effort as possible. The days are gone, in which a person needs to fill out complicated forms and being matched by powerful algorithms; these days, a simple tap of a button can get you a date in less than 5 minutes flat. There are many Dating Apps For Relationship in the market, which route the peoples on the ways to find a perfect date for them. Tinder, XOC kind apps can let you find your perfect match. Are You Looking For A Place To Meet Your Date? Mobile apps had helped you to find your date and now your time to approach your partner to meet them. It’s been proven that a place has the vibes that can turn the emotions and feelings into a bond of love. Well, mobile apps have made the life of the people easier in every region whether it is chatting, browsing or gaming. And now, there are many apps which enable you to find out the best locations like Restaurants, Nightclubs, Bars, and Cafes to take your date out. There are a number of Restaurant booking apps, which will help you to make this task easy. A survey explains that users now expect “Rich, location-based, transaction-aware apps” that offer great experiences and genuine benefits. This is the reason that most of the restaurant owners are running towards launching their mobile app and many startups are focusing on on-demand app development adoption. If you have missed out on restaurant bookings for Valentine’s Day dinner date, you can order from Bite Club and many other mobile apps virtual restaurant for delivering home-style food to your doorstep. Impress your date with the homemade food. Do You Want Your Date Impressed With Lovable Stuff? I don’t think that technology has built yet by which users can send virtual hugs but yes there are plenty of other ways apps. You can find appealing and variety of gift stuff on by simply selecting Gift options at local stores: The Shopsity app helps you connect to the lifestyle retailers in your vicinity. You can see the complete catalog of the store, what is selling, including photos, sizes, price and then decide which store to go for. Now it’s time to look at your pocket. Yes, in the feel of being loved or admirable, you have spent so many bucks. You know what mobile apps can even help you to calculate your expense. How cool it is. The Wally app helps you keep a tab on your Valentine’s Day spending. It lets you log the details of your expenses like amount, venue, time, category, notes, and photos of receipts with the app’s InstaScan feature. It can also attach photos and tag friends to capture the people and moments associated with your every expense. The app is available on Android and iPhone. If you are single and searching for something fun to do on Valentine’s Day, there’s no shortage of ideas and mobile apps. Feel the love on this Valentine’s Day with the help of mobile apps, as most of the businesses are approaching mobile app development companies to build their dating apps, one can leverage the benefits from those dating apps to make their Valentines special. Do you have any idea to make this Valentine even more special with new app idea? You can ask us to get it done for you. Drop your queries at sales@ripenapps.com and get handy with another sensational dating app.